Ice Stasis Lochindorb, Moray, Scotland. I have to thank my children for finding these golden nuggets trapped in solid ice at Lochindorb on the Dava Moor. 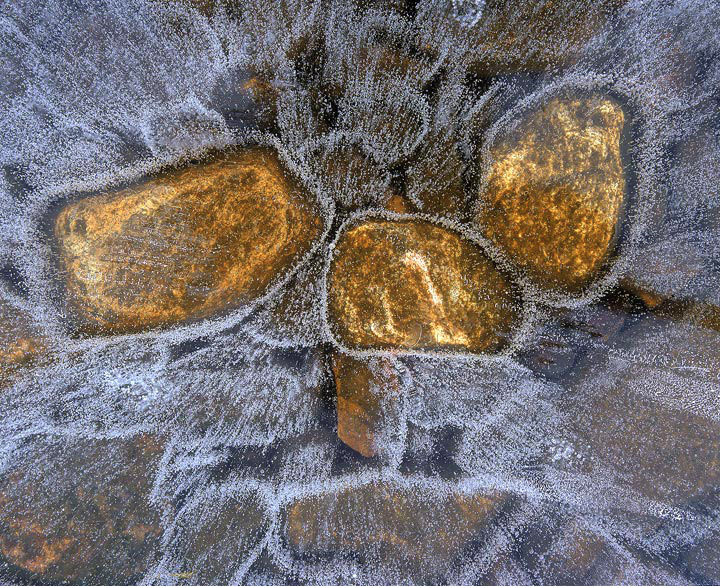 The countless thousands of bubbles are caused by the drop in temperature and consequent degassing of rotting vegetable matter as it releases carbon dioxide into the atmosphere as it did so the temperatures dropped and each bubble became a frozen stream of expanding size radiating from the edge of the stones. The blue cast from the overhead sky has tinged the ice and juxtaposed very nicely with the golden nuggets beneath.